Cask is a set of cool flower pots to hang inside. 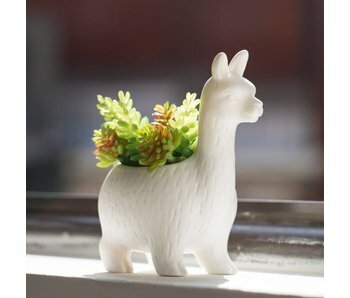 Skittle is a cool flower pot to hang inside, for example in front of the window. Manufactured in ceramic and supplied with leather hanging cord with a length of 66cm. 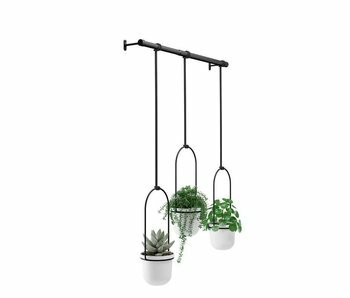 The Triflora plant hanger finally makes it easy to hang plants in front of your window. Triflora comes with all mounting material and can be mounted on the ceiling or wall. Handy and decorative wall rack from design brand Umbra, with at the bottom a shelf to put your stuff on. At the top there is a flower or storage pot, so this rack can be used surprisingly versatile in various places. Handy and decorative wall rack from Umbra Design. Ceramic flower or plant pot with a picture of Mr. Hamilton. Give him a very own look based on your personal plant choice. A playful piece of design and kitsch by Swedish designer Ingela P. Arrhenius.